Childcare will be provided from 8:00a.m. to 8:00p.m. Location will be at the LDS Church building on the corner of Chubbuck and Hawthorne. Children need to be toilet trained. The same parent must check in and check out their children. No exceptions! A child may remain in childcare for a maximum of two shifts per day. (One shift preferred). Parents need to provide a sack lunch or sack dinner for their child(ren) depending on their shift. 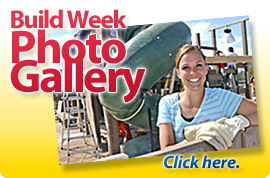 You must be working on the playground in order to use the childcare for your child.